While foreign observers and media have fixated on Kim Jong Un’s buildup of entertainment facilities such as water parks, fun fairs and a ski resort, the DPRK leadership has also devoted considerable resources to important infrastructure projects such as energy production, port improvement, highways, railways and airports. However, while it appears the DPRK has placed a public emphasis on the promotion of renewable energy, recent developments indicate that coal power will remain an important piece of the North’s energy policy, particularly for Pyongyang. Estimates of the DPRK’s electrical output vary, but the country’s energy problems have been widely documented. Data derived from estimates published by the Nautilus Institute. These numbers are difficult to verify since the DPRK has published only limited statistics on its electrical output, and access by foreigners is highly restricted. In documents submitted to the United Nations Framework Convention on Climate Change’s Clean Development Mechanism (UNFCCC CDM), however, the DPRK claimed that between 2005 and 2009, six thermal power plants and eight hydropower plants produced between 22,000 and 23,000 GWh per year. The Bank of Korea’s energy estimates for the DPRK have not changed significantly from 2009, when they reported a 6.93 GW capacity producing 23,470 GWh. This estimate is not strikingly different from 1980, when the DPRK’s electric grid had a capacity of 5.4 GW and output of 25,000 GWh. Of course, the methods and models used to generate this data are unknown to the author. The DPRK’s policy response to power shortages has also been widely reported. It has implemented a rationing system that restricts supply to non-strategic sectors and geographic areas. Coupled with rolling black-outs, the North has tried to maintain large, old coal-power plants while developing new, “sustainable” hydro, solar and wind power (particularly at the local levels). One of the largest of the new renewable projects designed to bring electricity to Pyongyang is the Huichon Power Station(s) in Jagang Province. Launched in the final years of the Kim Jong Il regime, the government prioritized the construction of the Huichon Power Stations (No. 1 and No. 2) to boost energy supply to the capital in time for the celebration of Kim Il Sung’s 100th birthday on April 15, 2012. Figure 1. Huichon Power Station No. 1. Image: Bing Maps, date unknown. Figure 2. Huichon Power Station No. 2. Image: Google Earth, March 19, 2013. These power plants were never registered with the UNFCCC’s Clean Development Mechanism program, so they have not been visited or audited by outside organizations. However, multiple reports in the South Korean media indicate the plants are capable of generating 300,000 KW. 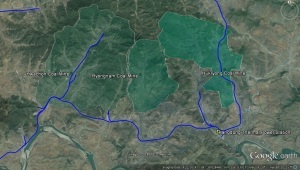 Based on commercial satellite imagery, dedicated transmission lines were built from these two hydropower stations to the Unsan Transformer Station, which collects electricity from the Thaechon Power Station and Taedonggang Power Station for delivery to the Yongbyon Nuclear Scientific Research Center. From the Unsan transformer station, power is carried directly to a newly constructed transformer station in Hyongjesan District, Pyongyang. From the Hyongjesan Transformer Station, electricity appears to be distributed to the northern and western areas of Pyongyang such as the Ryongsong and Mangyongdae Districts. Figure 3. 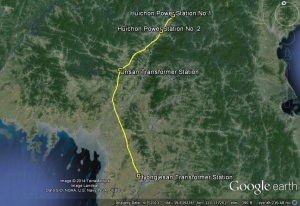 Map of Power Transmission lines from Huichon Power Stations 1 and 2 to Unsan and Pyongyang. Image: Google Earth, April 9, 2013. Annotated by Curtis Melvin. The Huichon Power Stations were officially put into operation on April 6, 2012. However, according to anecdotal evidence from the time—from visitors to Pyongyang and expatriates in the city—this did not seem to bring about a measurable increase in electricity supply. There are several possible explanations for the continued shortage. The first is that some of the increase in power supply was absorbed by strategic industries at earlier nodes in the distribution network. Additionally, increased electricity supply could have been consumed by the “completion” of new housing units in Pyongyang such as the prestigious new high-rise apartment buildings on Mansudae Street. Reports also claimed a drought followed by winter weather had left water levels too low to make full use of the turbines. Another explanation for the chronic power shortage lies in the way high-profile construction projects are completed in the DPRK. Since Kim Jong Il insisted that the project be finished in time for Kim Il Sung’s 100th birthday, construction was hurried. It is possible that problems overlooked in the rush to build the power plants by an arbitrary political deadline could have negatively affected the project’s output around the time operations were officially launched. This general problem was discussed recently in the North Korean academic journal Economic Research (Kyongje Yongu, 2014, Issue 3). The Next Solution: Pivot to Coal? Despite the completion of the Huichon Power Stations, and other renewable plants, power shortages have remained a problem in Pyongyang. The North Korean government, however, is working to build additional electricity generating capacity for the capital. Yet unlike other power plants built after the “Arduous March,” which are primarily “renewable” (hydro, solar, and wind), the DPRK is building a new coal-powered thermal power plant in Samdung-ri, Kangdong County, in eastern Pyongyang. Figure 4. Boundaries of Pyongyang (in green) according to the districts designated in the most recent SPA election. 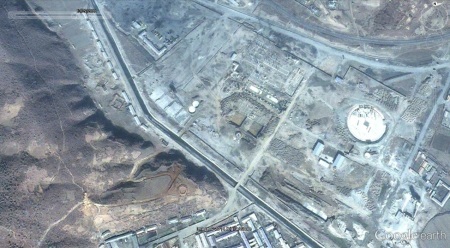 Commercial satellite imagery shows that construction began sometime in late 2010 or early 2011. Steady progress was made on key facilities such as the distinctive cooling tower (the first on a coal power plant in the DPRK), employee housing, electrical switch yard, generator hall, smoke stack and conveyor system for bringing coal into the boiler building. Figure 5. Construction of the power plant in earlier stages. Images: Google Earth, (before) October 29, 2011 and (after) March 20, 2014. Figure 6. By August 2014, construction had progressed to a point where key facilities could be identified on satellite imagery. 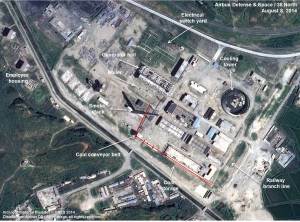 Since construction began, no official information has been released on the capabilities or specifications of this new power station, nor has it ever been featured in North Korean media. 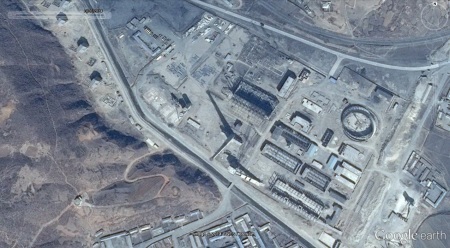 Nevertheless, commercial satellite imagery reveals that the new power plant has two transmission lines to date. The first connection is to the transmission line linking the Pukchang Thermal Power Plant with the Junghwa Transformer Station, a major electrical hub for southern Pyongyang as well as North and South Hwanghae Provinces. The second transmission line links the plant with an electrical substation at the Taedonggang Fruit Farm. Figure 7. Transmission lines for the new Kangdong Thermal Power Plant. It also reveals geographic advantages to the plant’s construction site. 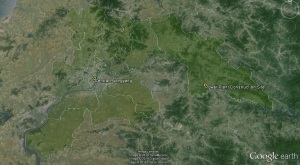 Unlike Pyongyang’s other coal power plants, the Kangdong plant is being built at a distant, rural site. This will help prevent populated areas from being exposed to unhealthy carcinogens from the smoke stack. Additionally, the new Kangdong Power Plant will be equipped with a dedicated railway line and is strategically located near large coal mines including Hwachon Coal Mine (under the Sangwon Cement Complex Enterprise), Ryongnam Coal Mine and the Hukryong Coal Mine, among others. Assuming the coal mined in these areas is compatible with the plant’s technology, the likelihood of shutting down the plant due to a coal shortage may be minimized. Figure 8. 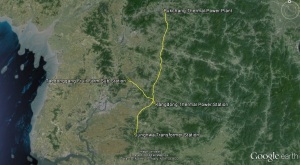 Railway lines connecting the Kangdong Thermal Power Station to nearby coal mines. Image: Google Earth, April 22, 2014. Annotated by Curtis Melvin. How Does the New Plant Measure Up to the Other Coal Power Plants? Source: Data published by the Nautilus Institute and Naenara. There are some important caveats to note when examining this data. First, the capacity estimates are based on officially released data and may not be reflective of the plant’s actual capabilities. It is impossible to know how much production capacity has declined at these individual plants since their construction, but outside estimates of the Pukchang Thermal Power plant put capacity as low as .5 GW, less than one-third of its official capacity. Secondly, the GWh table is derived from 2009 data published by the DPRK and is not based on an independent audit. If accurate, the Pukchang plant would have to be operating at capacity for nearly 70% of the year to produce the quantity of GWh reported, the likelihood of which is nearly impossible. The Kangdong Thermal Power Plant’s generator hall is approximately 90 meters by 30 meters, making it the smallest of the country’s large coal-powered stations in terms of square footage. A plant of this size could be capable of generating between 100 MW and 300 MW (.3 GW) depending on the technology employed, so it could conceivably make up for a 19 percent decrease in capacity at the Pukchang Thermal Power Plant. This raises the question as to why the DPRK is building a new plant to supplement the Pukchang complex rather than just restoring it. The Pukchang Thermal Power Plant is a decades-old Soviet-era facility that has probably experienced a tremendous amount of wear-and-tear. As with any production capital, it eventually becomes cheaper to replace some hardware rather than continue to pay to maintain it. In addition, the plant’s production problems were exacerbated by the type of heavy fuel oil used at the Pukchang plant provided by the US under the Agreed Framework. This particular heavy fuel oil had a high sulfur content that turned into sulfuric acid in the boilers, causing significant damage. This type of problem is very common in developing countries that use low-quality fuels. These recent developments confirm that an increase in electricity supply to the capital was a top policy priority for Kim Jong Il. Though Kim Jong Un has not yet made energy policy one of his public priorities, continued construction of the Kangdong Thermal Power Plant indicates that energy security remains an important goal of his regime. At this point, however, many questions remain unanswered. It is unclear when the plant will be completed, and if its launch will mark the return of a pre-Arduous March level of energy consumption in the capital. It is also unclear how much the plant’s construction will cost, or if the DPRK has engaged with an overseas partner to construct the factory or provide new technology. Finally, it is unclear if, despite recent pronouncements, the DPRK sees the achievement of domestic energy security primarily through domestically-sourced, coal-powered thermal power plants supplemented by renewable power projects, rather than the other way around. See this report by the Nautilus Institute. The Bank of Korea published this 2009 data. The six thermal power plants are the Pukchang, Chongjin, Pyongyang, East Pyongyang, Chongchongang, and Sunchon. The eight hydro power plants are the Hochon, Anbyon, Tongchon, Sodusu, Pujon, Taedonggang, Namgang, and Suphung. The data can be found at Naenara. The DPRK has submitted seven Power plants to CDM, and these were audited. See here. It is unclear if the 300,000 KW estimate refers to one or both of the power plants. See source material here and here. This number was offered in a September phone interview with John Fetter, an energy consultant at FSI Energy who has experience with the DPRK’s power system. For comparison, see the Rosa Thermal Power Plant in India. It is composed of four generator halls each capable of producing 300 MW. Each of the generator halls are approximately the size of the generator hall at the Kangdong plant. This story was recounted by John Merrill, a former INR official at the US Department of State who worked on North Korea issues.